Once upon a time, people used disc-cutting machines to cut their own discs. Eventually (during the 50s? ), people switched to magnetic tape for home recording. That's the history as I know it--it's probably a bit more complicated than that. But here's a home-made Christmas disc by a very young man named Billy. I know this, because on the second side Billy introduces a piano piece (nothing I recognize; sounds like a by-ear number) with the words, "This is Billy, making you a record for Christmas of (in?) 1948." Thus I know the recording year. Of course, Billy could have simply been the engineer, but I suspect he's the ivory tinkler, at least on side 2. He's a decent player for a kid. I'm designating the piano solo (which features a false start, followed by some Charles Ives harmonies, before it gets going) as side 2 because it contains no label writing; the flip (above) lists White Christmas and Jingle Bells as the pieces, and what looks like "Billy Four" as the artists. So I'm assigning it side-1 status. Problem is, there are only two musicians--tenor (?) sax and piano, so maybe "Four" (or "Lour"?) is Billy's last name. Will we ever know? Condition isn't very good (Maybe I should have employed some hiss filtering), but I used the curve marked "AFRS Transcriptions #1" in my VinylStudio program, and it brings the music out loud and clear over the disc noise. AFRS, of course, is Armed Forces Radio Service, which eventually became Armed Forces Radio and Television Service (AFRTS), or "A-farts," as we called it in the Navy. AFRTS would send my first ship videos to play over the closed-circuit system, and one night I was showing a program for the crew while watching a tape on another machine. Meaning to fast-forward the other tape, I accidentally fast-forwarded the AFRTS program. Knock on the door--a crewmember. "Could you please reshow the last five minutes or so?" he asked. Oops. AFRTS programs always included Navy recruiting spots, and you can imagine the responses they received in our TV lounges. Anyway, of course this disc has nothing to do with AFRS, but the curve sure matches up beautifully. So, why did I buy this Goodwill album? Well, after going through eight or nine boxes, I'd picked a small group of LPs and 45s. My brother-in-law was standing next to me. I thought this jacket was kind of cool (it is--surprisingly so for a cheapo label), so I held it up and said, "Do I want this?" "Yes, you want this," he replied. So I bought it. The label is Hollywood, and here Hollywood is pulling the standard budget-label read-the-smaller-print scam: a big (colorized?) 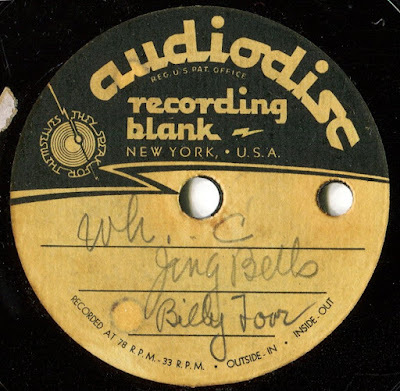 picture of the famous artists being exploited, the artists' name in big letters ("Dorsey"), and no Tommy or Jimmy Dorsey present on the disc. Surprise!! Just Maury Laws' Orchestra and Chorus, which does a surprisingly decent job recreating the Tommy Dorsey sound (7 to 8 on a scale of 10). (I don't think any of these were originally Jimmy Dorsey sides, but correct me if I'm wrong.) Surprisingly decent, because the budget couldn't have been very sky-high. In all, a fun LP with a few outstanding performances. My only complaint: some truncated arrangements, including my two all-time favorite TD tracks: Marie and Sunny Side of the Street. How could they? But there's an excellent Opus No. 1, so maybe I can forgive this lapse in $1.98-LP wisdom. This junk-label album far exceeded my low expectations, so I'll give it an A. Besides, the cover rocks. Biggest surprise: the very decent sound. I combined left and right for fabulous results. Not usually, but sometimes the poverty-row record companies get it right. Well, except for putting the jacket's track listings in the correct order, but that's a proud budget label tradition. These folks have standards to uphold. 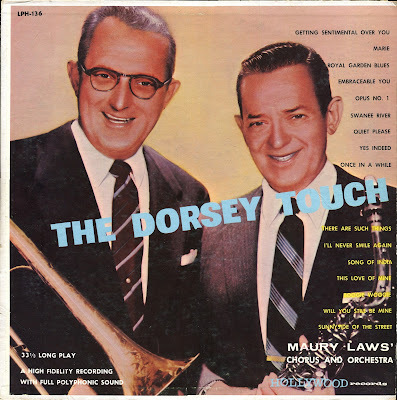 Click here to hear: The Dorsey Touch--Maury Laws' Chorus and Orch. The couple (above) looks like it's being tortured. In the Hall of Bad Poses, this jacket cover probably has its own special room. Now, when you see an album cover this banged up (I cloned out some of the worst of it, save for the pose itself), you can only assume the disc is toast, but in fact it's a solid average. So I got good sound out of all nine (yes, nine) of the tracks. Oh, and in typical zero-budget label fashion, the jacket title listings are out of sync with the actual order, and the label sports a different title than the front (Teenage All-Time Favorites). Yup, everything checks out. 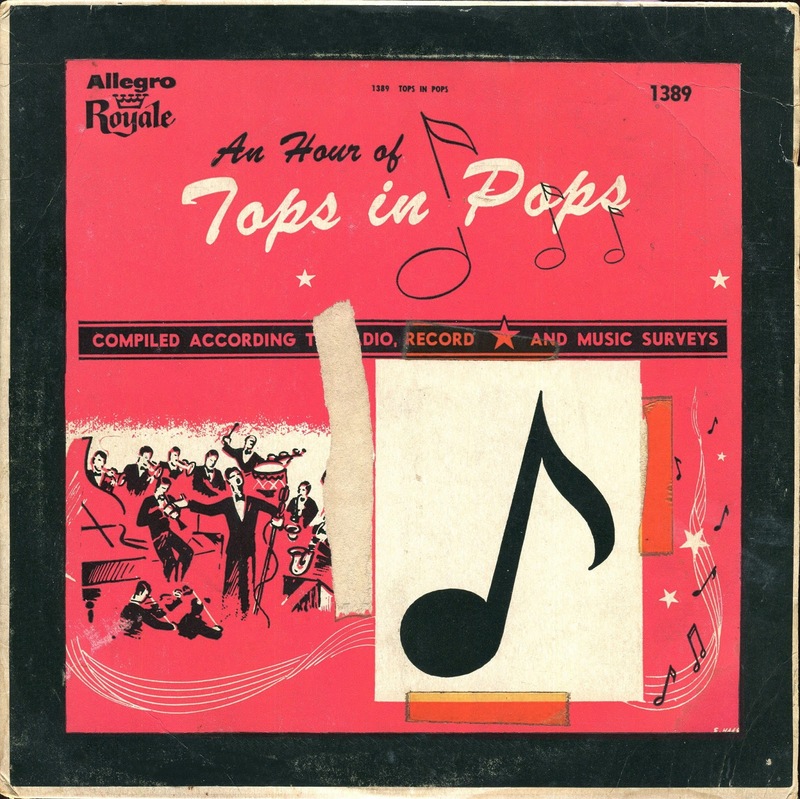 Despite the 1958-style art, this collection of sound-alike hits dates from 1963! 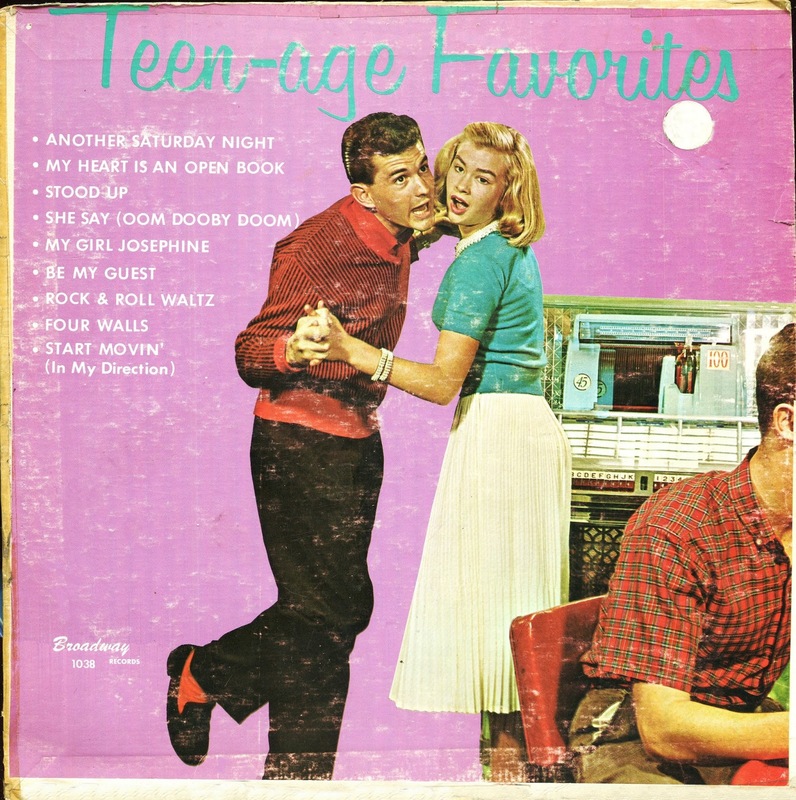 And what a group of 1963 "Teen-age Favorites" (keeping in mind these are all "fake" versions)--the 1954 Kay Starr hit, Rock and Roll Waltz; the 1957 Jim Reeves hit Four Walls; Sal Mineo's Start Movin' (In My Direction), same year; two Fats Domino numbers (Be My Guest, My Girl Josephine--1959 and 1960); and the then-current Sam Cooke classic, Another Saturday Night. I guess none of the teens surveyed by the Broadway label were into the Beach Boys, Lesley Gore, Stevie Wonder, or Bobby Vinton. Anyway, this very strange worth-it-for-the-cover-pose-alone album is actually pretty fun listening. Find out for yourself. You'll thank me (or not). An astonishingly good set of "fake" hits, considering it's from the cheapest of all cheapo record companies of the Fifties: Record Corp. of America, not to be confused with RCA. Some wear on this disc, but decent sound overall. 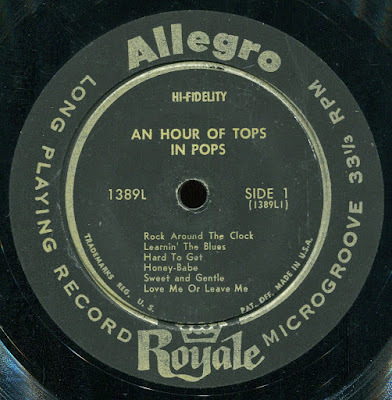 Some of the performances border on quite good (Rock Around the Clock, for instance, the best cheap-label copycat version of the classic tune anywhere). De-clicking this was a chore, but a happy one, because these tracks were worth rescuing from the ravages of needle drops, digs, and general turntable mistracking. I take this stuff seriously, Lord help me. Notice the ripped-off portion of the cover, which was likely a track listing. Whoever did it could have done it a little more gracefully, but it's cool, campy cover anyway. Best guess on the release year: 1955, because all of these are 1955 hits. The LP cover says 1954, but do you trust Record Corp. of America?